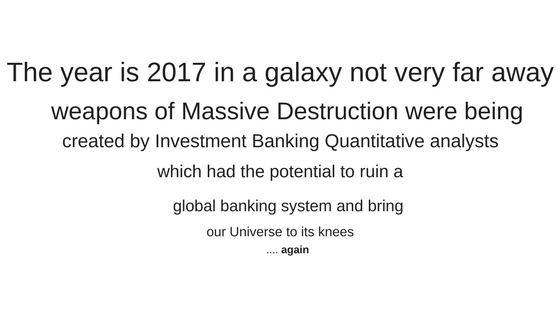 The Next Weapon of Global Financial Disaster? CDO’s were sophisticated financial tools that banks used to repackage individual loans into a product that was to be sold to investors. They did this because it was a source of funding to make new loans and to grow faster; it moved the loan’s risk of defaulting from the bank to the investors; and greed ie CDOs gave banks a new and more profitable product to sell, which boosted share prices and managers’ bonuses. CDOs allowed banks to avoid having to collect on them when they became due, since the loans were now owned by other investors. This made them less disciplined in adhering to strict lending standards, so that many loans were made to borrowers who weren’t credit-worthy — ensuring disaster. Unfortunately, the extra credit availability created an asset bubble in housing, credit cards and auto debt. Housing prices became unrelated to their actual value, and people bought homes simply to sell them. The easy availability of debt meant people were charged too much. Worse still was that CDOs became so complex that the buyers didn’t really know the value of what they were buying. They relied on their trust in the bank selling the CDO without doing enough research to be sure the package was really worth the price. This was the first Global Financial Crisis. Well guess what, the sequel has arrived. Collateralised Loan Obligation – CLO. Did you look twice to check the name? Marketers got paid a lot to come up with such a catchy name. Propeller-head quant analysts working for Investment Banks are bundling risky low-grade loans into attractive looking packages and high credit ratings. Momentum is growing for CLOs with $1bn+ deals already being done– including the biggest deal since 2006 which has just occurred. Is this triggering any bad memories for anyone ? When the risks became obvious for CDOs it was apparent the cracks had existed for some time – innocuous cracks turned into the Grand Canyon – understood a tad too late. The originators of CLOs are meant to keep some of the risk assets themselves ie keeping some of the downside. This would cause diligence about the underlying asset quality. BUT clever financiers have begun to arrange for third parties to take on this safeguard risk. The cracks with CLOs have started. The bells are ringing quietly. It is NEVER different this time! Have the credit agencies got methods which can price CLOs better than CDOs? It doesn’t appear so. Modelling for CLOs assume the risk of default correlation is low, but we all know that is what happened in 2007/08. It is NEVER different this time. If and when significant numbers of defaults do come – the investment grade debt will be worthless, not to mention the junk grade debt. The only upside is we will a biodegradable product to wrap our fish and chips with! Will the regulators allow the CLOs to be the next CDOs? Will the rating agencies stand up to the inevitable pressure? Which countries will have the capital to bail out their banking system this time? Will we be able to avoid an even bigger crisis? Will the lessons of the GFC 2 be learnt before the GFC 3? How did you fare in financial year 2008/2009 when the return for the stock market was -24% ? In that terrible year, for the 70+ stocks Pythagoras is currently offering, our recommendations returned +12% – a massive 36% better. How did your investments go?